Howard got back on his feet quickly however, and in 1940 found a better-paying job elsewhere. Then, as World War II raged, Carolyn got a baby brother, John. Things once again looked bright for the Tongs, but then once again tragedy struck, as John died at just 8 months old. Howard Tong recovered once again, and in 1947 he became superintendent of schools in Scappoose, a town booming as the post-war suburbs grew north from Portland. To keep pace with the burgeoning population in the Columbia River town, Howard quickly began a campaign to raise taxes. Voters rejected the levy proposal, and over the next three years rejected it three more times. Fed up, Howard Tong resigned. The next stop for the Tongs was the Oregon Coast, where Howard became high school principal, and life finally became stable for the family. In 1965, Howard was 58 and dreaming of retirement. Howard and Gwen packed their furniture and moved to Monroe, just a few miles from Corvallis, where their love story had begun 35 years earlier. Howard became superintendent in the small farming community. Four years later, Howard told his board that he planned to retire after the 1970-71 school year. He didn’t last that long. When mimeographed fliers popped up around Monroe urging the recall of two local politicians, it wasn’t hard to trace them to the town’s only mimeograph machine, which was outside Howard Tong’s office. He admitted that he had produced the fliers and was promptly fired. Turmoil returned to the Tong household as a bitter lawsuit ensued, with Howard demanding the district pay him the $11,000 he would have earned in the last year of his contract. Once again, however, financial problems took a backseat to tragedy when his college sweetheart, Gwendolyn Morgan Tong, died in 1971 at the age of 61. Howard always was one to recover quickly, and within a year he was married to a neighbor, Hazel Cleveland, Howard Tong settled in for a long retirement. It turns out that it wouldn’t last long at all. Just nine months after the wedding, Benton County sheriff’s deputies were called to the Tong home in Monroe, where they found Howard dead of a gunshot wound to the heart. His newlywed bride, Hazel, also had been shot in the chest, but was still alive. The killer was, instead, lying in a hospital bed in Corvallis, where Hazel Cleveland Tong admitted that she had pulled the trigger of a .22-caliber rifle several times. One of those shots killed Howard; four more were, she said, intended to kill herself. Howard was laid to rest next to Gwen, and Hazel awaited trial after pleading insanity. The case drew headlines across the state because it involved what soon would become known as “battered woman syndrome,” with Hazel alleging that Howard had been an abusive husband. Her trial lasted only one day before she was found not guilty by reason of insanity. The judge ruled that she was a danger to society, however, and remanded her to the Oregon State Hospital, staying her commitment if she agreed to see a psychiatrist in Corvallis instead. Monroe returned to its quiet routine, and the case soon was mostly forgotten. 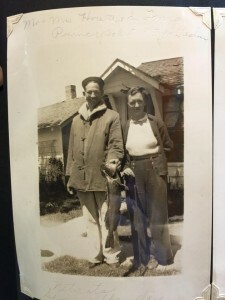 More than 40 years after the trial and about 80 miles north of Monroe in another quiet town, a history buff named Helvi Smith located a 1939 photograph of a smiling couple holding a large fish in front of a cottage in Netarts, Oregon, with what she thought were the names Howard and Gwen Long penciled in, with a note saying that Howard was the Gaston High School principal who had taken advantage of Senior Skip Day to take his young wife fishing at the Coast. On second glance, Helvi thought the name might be Tong, not Long, and she asked members of a Facebook group called the Gaston History Squad if anyone knew anything about the couple. 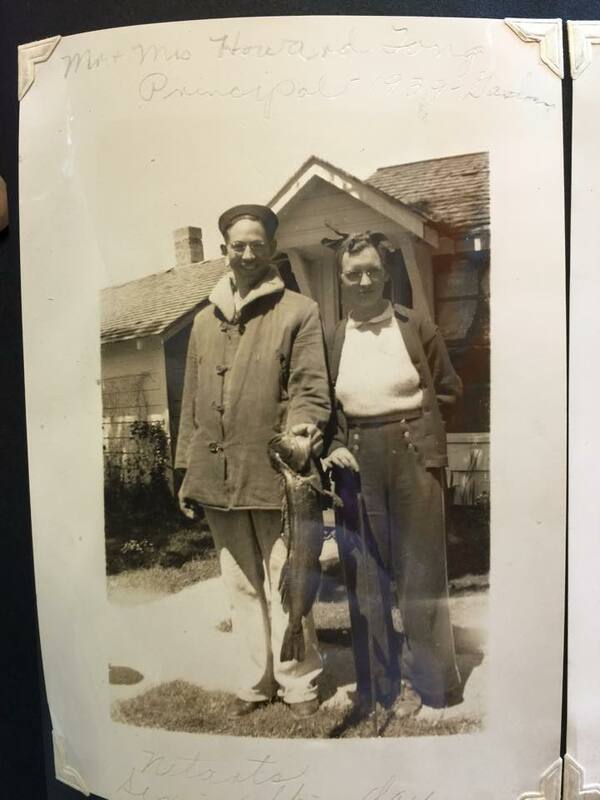 My wife, Kris, quickly dug into our archives and discovered that Howard Tong was the name of the Gaston principal in 1939, apparently with a great fish story to tell. Kris then discovered that there was a story much more interesting than the fish, however, and it was a whopper. Copyright 2015, Ken Bilderback. We’ll explore the evolution of jurisprudence, including how the justice system has treated women through Oregon’s history, in our next book, Law and Order at the End of the Oregon Trail, due out this summer.